SAN JOSE, CALIF. / PR Newswire – Energy-efficient homes of the future have arrived and are growing in popularity. 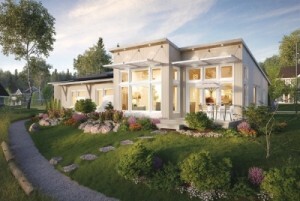 According to a report by McGraw Hill Construction, nearly one-third of new single-family homes in the U.S. will be green by 2016. They are energy and natural resource efficient, designed to reduce overall impact on human health and the environment. An increased number of consumers are going a step further and striving for net-zero energy homes that use renewable energy solutions, such as solar power systems, to offset all or most of their energy consumption. Across the country, the number of net-zero energy residential and commercial buildings doubled between 2012 and 2014 as cited by the New Buildings Institute. Experts predict the trend will continue. This entry was posted in Energy Conservation, Green Building, Nebraska / Midwest News, NewsBlog and tagged energy efficiency/conservation, Nebraskans for Solar, net-zero energy homes and businesses, New Buildings Institute, PR Newswire, solar-powered net-zero buildings, SunPower on November 17, 2015 by Helen Deffenbacher.